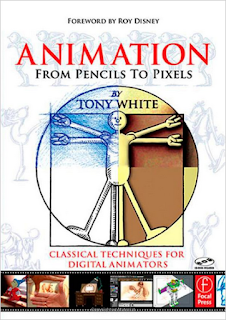 Animation from Pencils to Pixels: Classical Techniques for the Digital Animator by Tony White is not the kind of book you buy your aspiring animator child who wants to learn more about how to animate. Rather it's the kind of book best suited to animators heading into their first year in 'animation' college or anyone who has had the animation bug for a few years and really wants to dive into deeper waters. I say this because, right from the get go, Tony delves into the idea stage of animation. Not so much with the 'how do you get ideas' approach as the 'why you probably shouldn't steal other people's ideas' approach - and the consequences of that legally if you don't take his warnings on board. It's not difficult reading by any means, despite touching on copyrighting, contracts and licensing, however if you were expecting a book on just the actual drawing and creating aspect of animation then it's quite a lot to take in right off the bat. unexpected but perhaps more logical order. For example right after the chapter on Character Design and Backgrounds the next chapter is about Project Financing. Which doesn't seem a logical follow on but if you've got as far as character design then that's about the time you might want to start looking at how you're going to fund the rest of the project. With chapters on The Rules of Filmmaking and Soundtrack Recording and Editing next you really do start to wonder when Tony's finally going to get back to talking about actually animating anything. 160 pages in and finally you get to the chapter on Storyboarding and Animatics but, 21 pages later, you're back to reading about Digital Desktop Production, with descriptions of just about every aspect of production including who does what in a typical team. Then you're back to reading about the Principles of Animation, which covers timing, charts, keys, walk cycles and more. By following a logical order that's more in keeping with the entire production process Tony alternates quite a bit between the extremes of the very personal experience of working at your animation table, to the big picture views of how animation production works as a whole. Which can be a little tiresome as a reader. Despite that the content of the book is excellent. While it does cover actual animation techniques in some detail the reason to buy it is that it covers everything else about the industry that I suspect other animation books do not. Tony gives detailed discussion about the not very exciting but very essential use of production folders, how they are typically set out, organized and how to read the dope sheets they contain. The book is primarily geared towards 2D animation but there are some chapters on 3D animation that demonstrate how the principles learned in 2D animation are just as relevant to animating 3D models. In fact, Tony is a big advocate of 3D artists having good drawing skills and 2D animation knowledge. All through out the book are chapters discussing Tony's short film Endangered Species - to which the book is a companion. The film pays homage to many great animators and animation styles and techniques since the early days of Disney through to the more recent 3D Pixar movies. Tony uses parts of the film as an example many times through the book and even includes a scene by scene break down of how it was created. Unfortunately the finished version of the film is not included on the CD ROM. Not only that but the tiny pixelated work in progress version that is included is an embarrassment to all the effort that went into not only creating the film but writing the book also. In fact all the video embeded into the PDF book included on the CD ROM is of terrible quality. How it got approved for release by someone who prides themselves on quality is beyond me. The film takes far too long to download (considering it's being loaded locally on your computer). Aside from being tiny and pixelated, it's also water marked with 'work in progress' through the lower half of the picture. Added to that is, on my computer at least, the music overpowers the narration so much I could never understand what was being said. Fortunately you can see a good quality version of Endangered Species on Tony's personal website - which is not mentioned anywhere in the book? Perhaps he didn't have a website back in 2006 when the book was published? Thankfully it looks fantastic and the music no longer overpowers the narration. Well worth checking out along with Tony's other work. What drew me to buy Tony's book over others was that it specifically talks about digital animation. Wisely it doesn't actually go into the hardware and software in any great detail which means although the book is somewhat outdated, having been published in 2006, it's fared quite well in pointing you in the right direction for hardware and software requirements. For example, there is a chapter on The Paperless Animation Studio. Back in 2006 Wacom's Cintiq drawing tablets were relatively new and perhaps only within the reach of animation studios. These are much more common place today and are gradually dropping in price. Other software such as Toon Boom, Adobe Flash and Maya (3D) are mentioned but not talked about specifically. Only general principles are covered that reflect the common animation techniques used in each. In doing this, none of the principles discussed are tied to a specific release of the software. Summing up, Animation, From Pencil to Pixels is the most comprehensive book on the animation industry you'll ever own. Indeed you could make it the only book you ever buy. It touches on just about everything including an entire section in the included PDF book called Mega-hurts that deals with the health and well being of the animator. That said, its major focus is classical 2D animation. Whilst the principles of 2D animation should be a part of any animators training it does make this book more of a starting point from which to leap into the area of animation that specifically is of interest to you. For example if 2D classical animation is for you then your next purchase might be one of Tony's other books, such as How to Make Animated Films: Tony White's Complete Masterclass on the Traditional Principals of Animation or the industry staple by Richard Williams, The Animator's Survival Kit: A Manual of Methods, Principles and Formulas for Classical, Computer, Games, Stop Motion and Internet . If you're into 3D animation you might try The Art of 3D Computer Animation and Effects . Animation, From Pencils to Pixels is as detailed as an entire overview book can be (at 500 pages, 905 if you include the PDF on the CD ROM). It's a great reference book that you'll go back to but you will need another more specific book if you want to get into the finer details of actually creating animation.